For some weird reason however, the Angelfit blushes haunted me. 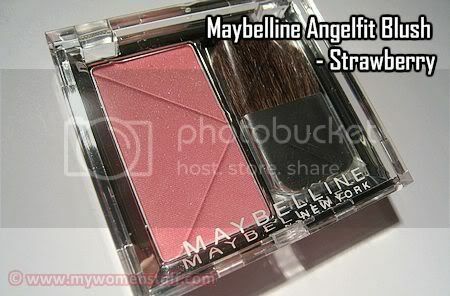 So when I got my mitts on the Maybelline Angelfit blush in Strawberry, I ripped right into it. I found the packaging cute when you look at it. The faceted plastic cover does look good. But when you touch it, its a little flimsy to the touch. The brush included is, in one word, rubbish. Just bin it because all it’ll do is scratch you silly. Located under the brush (and you might miss this one) is a mirror. Useful for touch ups but not useful for blush because I always need a large mirror when I apply blush to avoid the clown cheeked look. 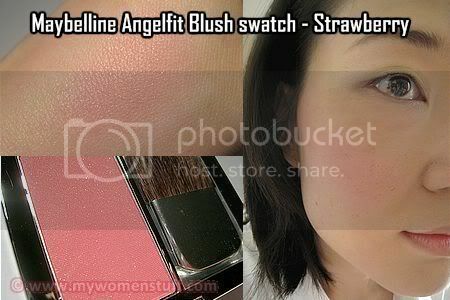 However, I forgave all Angelfit blush’s shortcomings when I used it on my cheeks (with my regular blush brush of course – I binned the brush included remember? 🙂 ) The colour goes on lovely and smooth and its pigmented for something found in a pharmacy / drugstore. It is a little powdery but I forgave it that. I also liked the colour Strawberry, which is a pink with slight peach undertone and very slight shimmer which is not very obvious on the skin. Here’s a rare photo of me with the Angelfit blush on to show you how it looks. I like how this pink blush suits my skin colouring (its very kawaii) and I like that its pigmented going on. In fact, I like everything about it which is saying a lot since I am very picky about my blushes. I even took this one on holiday with me and it was nice for an everyday blush used with a light hand. I reckon the colour will suit anyone from those with light to darker skin tones. There are 4 colours available and Jenn of Lipglosseater has some good swatches of them – Peachy Sweetie, Strawberry, Velvet Apricot and Creamy Cinnamon. At RM29.90 a blush I’d say they are a cheap and good find so no second thoughts from me! Maybelline Angelfit appears to be an Asia Exclusive item so if you are not in Asia, you may not have access to this line by Maybelline. Or you might – feel free to let us know! You might have seen some Maybelline Malaysia ads with a fresh faced pretty young thing and may have wondered who she is. 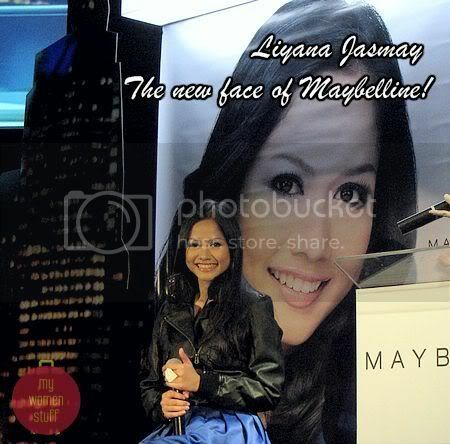 She is Liyana Jasmay – the new Maybelline Malaysia spokesperson and the new face of Maybelline for Malaysia. She’s young and energetic which suits Maybelline’s image and target consumers. She is also an accomplished young actress and singer. When I saw her, I could not help making the comparison to Avril Lavigne circa goth days. Long black hair, black clothes and dark eye makeup added to the image. Oh and the new song “Aku Tak Percaya Cinta” (“I don’t believe in love”) is suitably angsty, with lots of guitar and “Hey! Hey! You! You!” sorta lines. But she’s pretty and she’ll make a good cover girl for Maybelline so yay Liyana Jasmay! Isn’t she sweet? ooo the blush looks great. Thanks 🙂 As I mentioned to prettybeautiful, it does look like Silkygirl but performs way better. You were just a “tad” tired? 😛 I know the po-oh story – laughed myself silly when I heard it! 😀 I answered you on Twitter but my answer to Tippy is Nay! Was that the last one? I had no idea who this new girl is but she’s cute – fitting for Maybelline I think. I thought these blushes were pretty decent for drugstore. Wow, that blush looks lovely on you PB! Paris: Yeah it was Fasha Sandha after Siti. Quite a long time too, I often see her ads in mags and stuff. I kinda detest her and was hoping for her time to end…..XD Glad that it finally had. The blush color look so soft and pigmented. Look very nice on you! The new spokesperson is cute but I think the whole angst thing should be for Rimmel. more edgy. It reminds me… I love that Silkygirl spokesperson! she’s so cute. the one that had the makcik taking passport photo for her. Aww u’re being a lil harsh on this blusher, aren’t you ParisB? 😉 It may not be ur cuppa tea, but I’m liking this blusher! Yup I agree with u about being so affordable. In fact I got it during Guardian’s sale for only rm23.88! This is way better than my all-time fave Silkygirl blusher. Actually in my review I actually said that I liked this blush at lot. I hated the brush that came with it but the blush itself is lovely. LOL that’s the irony! Apparently I think both the brush & the mini “mirror” is cool. Though the latter doesn’t really serve a purpose. Yep gotta agree with u there, the blusher is sooo sweet!